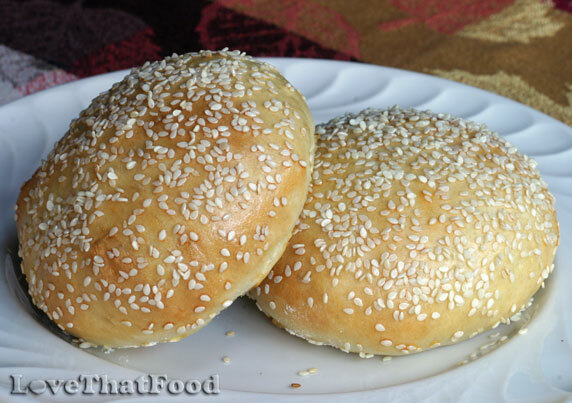 Tips: Hamburger buns may be coated with sesame seeds, poppy seeds, oats, minced onion, or other preferred toppings. Whole wheat flour may be substituted for a portion or all of the all-purpose flour, keeping in mind whole wheat flour will produce a heavier and more dense hamburger bun. Suggestion: May be used with hamburgers, turkey burgers, chicken burgers, tuna burgers, sandwiches and more. to make your own homemade hamburger buns! This hamburger buns recipe starts with an easy dough you can knead with the help of an electric mixer or bread machine. Once the dough has been kneaded, just as with other bread recipes with yeast, the dough is placed in an oiled bowl until it has doubled in size. Once doubled, the dough is divided into 8 separate portions which are formed into balls, then pressed down into disc shapes. The discs are then placed on a baking sheet lined with parchment paper and left to rise again until doubled. Once doubled, an egg and milk wash is lightly brushed over the tops and sides of each bun dough, then sesame seeds (or any other toppings you prefer) are sprinkled on the buns. The egg wash will give these hamburger buns a beautiful sheen and nice outer crust. In about 15 minutes, you've got fresh homemade hamburger buns to fill with any hamuburger recipe your heart desires! To see a great example of these how these sesame see hamburger buns can be used, see Asian Turkey Burgers with Pickled Asian Slaw. Insert dough hook attachment to an electric mixer. Add warm water to electric mixer bowl, then add yeast and whisk or stir briefly to combine. Allow to stand for about 5 minutes. In a small bowl, whisk together egg and melted butter, then add to water and yeast mixture along with sugar and salt. Briefly whisk again, then add flour and turn on mixer on slow speed. Continue mixing until mixture forms a smooth dough that does not stick to the sides. (Note: If dough doesn't eventually pull away from the sides of the electric mixer bowl, sprinkle in a small amount of flour (about 1 tablespoon, or more as needed). Once fully kneaded by mixer, transfer dough to a lightly floured work surface and knead a few times, folding dough into itself repeatedly. Form dough into a ball. Coat a large bowl (preferably glass) with a little olive oil, then place dough ball into bowl, turning a couple times to lightly coat dough ball with oil (this will prevent dough from drying on the exterior). Cover bowl with plastic wrap and allow dough to sit at room temperature until it doubles in size (1-2 hours, depending on room temperature). Once dough has doubled, transfer to a lightly floured work surface and briefly knead, squeezing to eliminate any bubbles. Cut dough into 8 equal portions (if you own a scale, weighing each portion each time you divide the dough to ensure they weigh the same is helpful). Form each portion into a ball, tucking edges underneath to create a smooth top. Using your fingers or a rolling pin, smash dough down to about a 1/2-inch thickness. Place dough disks on parchment paper on baking sheet, about 1/2 inch apart. (Tip: If you don't want buns to touch each other while baking so they have clean edges as shown in above photo, use 2 baking sheets and place dough discs at least 1 inch apart.) Sprinkle lightly with flour, then lightly cover dough discs with plastic wrap. Allow dough discs to rise again until doubled in size. Preheat oven to 375°F. In a small mixing bowl, whisk egg together with milk. Using a soft bristled pastry brush, lightly coat tops and sides of risen dough portions with egg and milk mixture. Top evenly with desired amount of sesame seeds (or poppy seeds, oats, minced onions, minced garlic, or other topping). Bake in oven for 14-17 minutes, or until buns have risen and turned light golden in color. Remove from oven and allow to cool on baking sheet. Once cooled and ready to use, gently separate buns from each other (unless you used 2 baking sheets and placed buns far enough apart so they wouldn't touch each other after baking). Slice horizontally and serve buns soft, broiled or grilled (when grilling, buttering before grilling is delicious! ).